It was with pleasure that we welcomed Mr. Xavier Bettel yesterday! 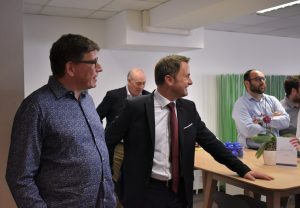 The Luxembourg Prime Minister visited our premises to discover our team and q-leap’s success! 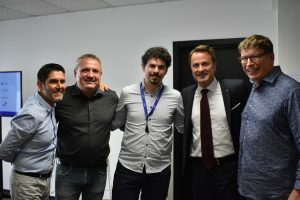 Hubert Schumacher, founder of q-leap, as well as Sylvain Perez, CEO of q-leap, received the Minister of Communications and Media and presented to him the story of the company. “The visit of Mr. Xavier Bettel is a valuable meeting for q-leap and allows us to highlight our employees who create value and contribute to the digitization of the country on a daily basis”, assures Sylvain Perez. Jorge Asensio, Test Automation Expert, gave a demonstration of our mobile test automation framework, made to test digital applications, and explained the importance of efficiency in testing. “It is very exciting to listen to how an application works and how specialists can solve problems”, our Prime Minister said. “Luxembourg must not miss the digital train”. “It was an honour to present some of our digital testing solutions to Luxembourg’s Prime Minister. But testing is not an end in itself. Software quality has to be addressed in the early stages of any software development lifecycle. This is also applicable to digital applications. We are here to make this happen so that Luxembourg takes the good train to the digitalization”, affirmed Julien Desmulier, Head of Testing and Quality Assurance. Xavier Bettel said that quality and security are crucial in the development of a new software, application or website. The digital era is already here and software quality practices have to follow and adapt to this trend. Ranked at 5th place in the DESI 2017, Digital Economy and Society Index, the Grand Duchy is one of the leading European countries in connectivity, digital performance and Internet use. 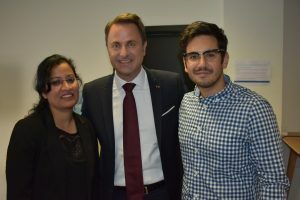 The entire q-leap team would like to thank Xavier Bettel once again for coming!